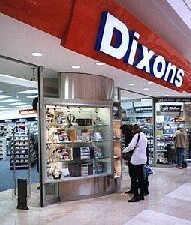 Dixons to stop selling anything. To anyone. Ever. Published on 17 August 2006. Ahh, Dixons. That famed electrical store which, three months ago, stopped existing as an actual entity, and turned entirely virtual with a woman poking at non-existing buttons on a non-existing screen and asking a non-existent customer “When do you want it? … That’s not a problem” (at least according to the ads). This was, of course, as parent company Currys ate up the Dixons brand and spat it out. Dixons. What a marvellous shop it is. And ethically aware, too. It does lots of recycling – not least of press releases. You may have seen in today’s newspapers and news programmes that Dixons is to stop selling analogue radios, them being so old-hat. This news has had a mixed reaction on the web: Some are cynical, some think it’s a step towards the future, some a sign of the times. But it’s undeniably getting wide coverage. It must be nice for an electrical chain to get so much free advertising of it’s modernity, but I can’t be the only one for whom this story rouses a profound sense of deja vu. It smells remarkably like a reheated story from last year, when Dixons decided to stop selling 35mm cameras, them being so old-fashioned and uncool. That, again, was seen as a big sea-change in consumer electronics, and generated much free advertising for the chain. But again, there was something not quite fresh about the story. That might be because the year before, Dixons decided to stop selling video recorders, them being so old-school and obsolete. This generated much free advertising for the chain, and every talking-head worth their appearance-fee told us that this marked a huge shift the consumer electricals market. But some complained that this story might not have been quite as modern as they’d hoped. Crazy suggestion, but that might just be due to the fact that a whole four months before, Dixons had decided to take a stand and stop selling Manhunt, a computer game which the parents of a murdered schoolboy blamed for his death. “Ooh, look at our corporate responsibility for the modern age” cooed Dixons, to the sound of many press photographs outside their stores. Rumours that they later regretted this when stocks of the game completely sold out in the rest of the country due to massively increased demand thanks to the oxygen of publicity the case provided remain unconfirmed. By now it must be struggling to think of things to stop selling. It apparently has personal CD players and “boom boxes” on its “endangered list”, but if it’s going to continue at this rate, there’ll be no non-existent buttons left for the virtual Dixons woman to poke at. The last case I cited is, admittedly, a little different, but it’s hard to deny that Dixons have put out almost exactly the same story for three years running now, simply replacing one piece of technology for another. And yet it still generates acres of media coverage and free advertising. This either means that newspapers don’t realise what Dixons are up to, or simply don’t care about serving three-year-old reheated reports to their readers – after all, it fills another page in the lazy summer months. Perhaps it’s irony – after all, this latest story is published right alongside the twenty-four-year-old reheated trash about A-Level results, for which the quote in this post (still on my wall) is probably still the best response published in a national newspaper. To anyone getting results today: I hope they’re what you wanted; if not then it might seem tough today, but you have your whole life ahead of you and you can still go on to do many wonderful things. A-Levels are no pre-requisite for greatness. This 931st post was filed under: Media, News and Comment, Technology. Comment posted at 21:32 on 17th August 2006. I have to admit I’m a little cynical about it. DAB is brilliant for Five Live, Virgin and other medium wave services. Surrounded by computers I really like being able to listen to the World Service clearly. However, the “snap, crackle and pop of the traditional wireless” might be getting replaced with digital, but that digital comes with pauses, gargles and a compromised quality. Maybe quality isn’t the top of the consumers list, but choice. Comment posted at 21:46 on 17th August 2006. No problem! It was a trackback – you just whack the provided trackback URI in the box below the main post box in WordPress, and it notifies someone that you’ve referred to their post. Back to radio… I mainly listen to speech radio, though occasionally music as well, and I get a lot of use out of my trusty DAB. Oddly, where I live, the FM reception is terrible, yet the DAB signal is crystal clear, so it comes in very handy. The relatively poor quality compared to FM is very evident, though, when listening to classical music – and that somewhat spoils the medium for me. As you say, though, choice is probably more important than quality when it comes to most consumers (and, of course, when is comes to which is easiest to market). Trackback received at 22:13 on 14th November 2007.